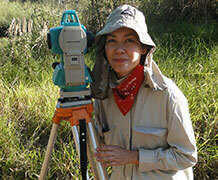 Mercedes Okumura is the coordinator of the Laboratory for Human Evolutionary Studies and a lecturer in bioarchaeology and human evolution at the Institute of Biosciences (University of São Paulo). Her early research was focused on the bioarchaeology of mid Holocene coastal groups from Brazil associated to shellmounds and the use of craniometrics to explore biological affinities among these past groups. Her current research focuses on the study of ancient DNA applied to these coastal groups, as well as the archaeology of Early Holocene hunter-gatherer groups from southern Brazil where she applies Cultural Transmission Theory and Evolutionary Archaeology to the study of stone tools (projectile points) using geometric morphometrics. Both methods (ancient DNA analysis and geometric morphometrics) are applied in order to better understand questions related to past boundaries and identities, as well as biological and cultural change and stability through time.